How do we manage our cravings for potato chips, soda and chocolate during the program? 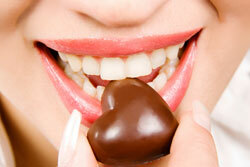 You should know that there are three common food cravings: soda, chocolate and chips. Dr. Cohen will let you know exactly when and how much you can have these foods while on the program. If you really want to drink soda with meals, do not exceed one small glass. Just replace the fruit you usually have for dessert with a glass of soda to satisfy your craving. You can pretty much use the same rule for chocolate. Three squares of chocolate equals 80 calories, which is equivalent to the calories of a cup of yogurt. You can replace your dairy serving with chocolate, but only if you stick to three squares! It's more difficult to find an equivalent food to substitute for chips in the Fast mode of the program. If you really want them, you can replace 2 slices of bread or half a cup of mashed potato with a small pack of chips. It's all up to you!